We aim to improve lives with innovation by utilizing new material and craftmentship, being creative on the basis of individual needs of customers, aspired to solving pain points and avoiding awful user experience. Desire of two bros who are of both differences and commonness for excellence and prosperity. With the impact of Chinese traditional culture which emphasizes on caritas, as the proverb saying, "Benevolent love, people love" and characters shaped by wisdom of being outwardly gentle but inwardly stern, C2Djoy is a brand full of literary and artistic atmosphere and entreprenures' persistence. In this info age, we try our best to simplify transaction procedure and directly provide dependable creations to customers with enthusiam and carefulness. Complying with the principle of inclusiveness, our set-up brand image and forged brand connotation have gained complete recognition from users and reached a bridge of thoughts. "Where there is a dream, there is a C2Djoy" is the most important vision of our company. From Apple to Fitbit, our Milanese replacement bands have gained wide identification and highly attention on Amazon for several years. Nowadays, people are attaching more and more importance to their health and fitness level. The more brave ones even challenge themselves in extreme activities and adventures. 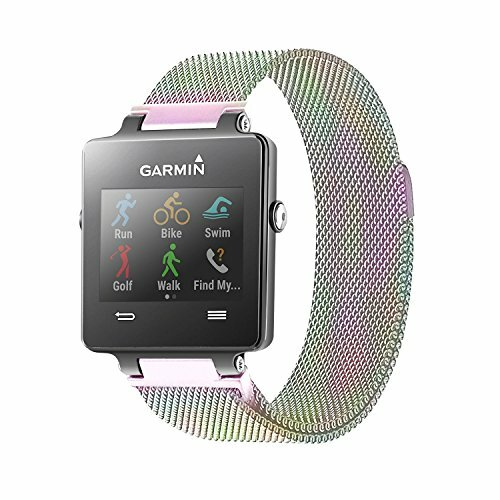 Considering the merits of Milanese material, we decided to apply it to Garmin watches which are well-konwn as forerunners of outdoor equipments for their accurate navigation system. We are always on the way of innovation. ☑️HIGHLY BREATHABLE & LIGHTWEIGHT DESIGN: 4000+ holes prevent sweat out and let air in, Comfortable wearing experience; 0.09 lb weight as light as an egg, yet having superior texture. ☑️STRONG WEARABILITY DESIGN: 72-hour Salt Spray Test and Abrasion Test with emery - the hard & sharp stone, Most-strict test ever taken; Be Military-class. ☑️DIRECTLY INTERCHANGABLE DESIGN: One hand to adjust easily Seconds to remove and replace with Compatible screw drivers and pins; Fits 4.8"-6.2" wrist width, without extra strap. ☑️FRIENDLY SERVICE: 1-year warranty basically if any issues related with your purchase, scan the warranty card to get one year more guarantee; Timely-reply within 24 hours, please feel free to contact us. If you have any questions about this product by C2D JOY, contact us by completing and submitting the form below. If you are looking for a specif part number, please include it with your message.